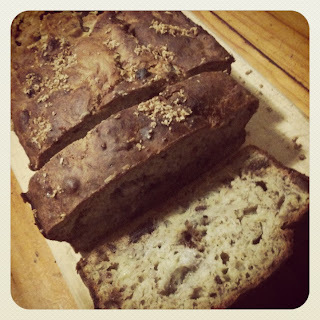 Last week I decided to unleash my inner housewife girlfriend and bake for S and I. I am doing sugar free February and found a perfect recipe for a sugar free Banana and Date Loaf. We went shopping on Thursday night and I went to the fruit section only to realise the bananas were green. Cue annoyed me! I couldn't bake it right away and I spent the week willing my bananas to hurry up and ripen. Last night, finally I had rippened bananas so I baked. It is amazing! Even though there is no sugar or sweetener, waiting for my bananas to ripen made them extra sweet and the loaf is perfect!